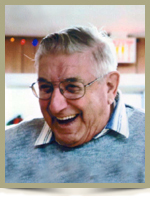 Fralic, Lee Howard, 87, of Brooklyn, Queens County, passed away on Sunday, September 22nd, 2013, in the Queens General Hospital Liverpool. Born in Beach Meadows, he was a son of the late Andrew and Maude (Pye) Fralic. Lee spent many years at sea, first as a Merchant Marine before spending over 30 years on the Gypsum Boats. He later went to work at Michelin Tire where he worked up until his retirement. Lee enjoyed playing cards, fishing and hunting. He was a member of the Royal Canadian Legion, Branch #38, Liverpool. He is survived by daughters Judy (Francis) Wagner, of West Berlin, Sheila Joyce (Han) Van-Beek, of the Netherlands, Denise (Peter) Winfield, of Greenwood; son Carlton “Carmie” Lillian, of Brooklyn; grandchildren Carmen, Cindy, Wade, Tonya, Shannon, Craig, Mandy, Jennifer, Hannah; great-grandchildren Alexis, Alexander; brother Cecil (Emily), of Milton; many nieces and nephews. He was predeceased by companions Hilda Laws, Blanche Bowers; sisters Goldie, Ida, Lena, Florence, Hilda; brother Ross. Judy and family, so sorry for your loss. Please know that we are thinking of you all during this difficult time. Carmie and Family, sorry for your loss, enjoy your memories. To the family of Lee Fralic we wish to express our deepest sympathy. Kip knew him for many years before I had met him and had always such good things to say about him. I met him at Michelin and after that we would go visit him. He always made us feel welcome. A very friendly man one who you liked to be around. His family can be very proud of him for his hard work and family life. Uncle Lee will always be remember in my heart. He loved to play cards in my family home, and we loved to hear him laugh. I was so sorry to hear of his passing, he will be missed, my thoughts and prayers are with you all, Judy, Sheila, Denise and Carmon. Carmie & family,so sorry to hear of Lee’s passing.Always liked to have a chat with him & loved his smile.Take comfort in his memories. Judy, Sheila, Denise, Carmie & Your families, we are so sorry for the loss of your father. He will be missed by many. Memories of all the happy times spent together will help you at this time. Judy, Carmie, Sheila and families – I’m very sorry to hear of your Dad’s passing. Please accept my deepest sympathy. Going to miss you gramp R.I.P. Carmie and family, so sorry for your loss. Keep your memories close. We are sorry to hear of your loss. Our deepest sympathy to your and your families. May your love and support of each other help you in the difficult days ahead. Just a line to let you know I am thinking of you. To Carmie and family,Thinking of you all at this sad time..You are in our prayers..
Judy, Carmie and family: I am sorry for your loss. My sincere condolences. To the Fralic Family:My Deepest sincere sympathy,condolences and prayers are with you at this time of your very sad loss. l was shipmates with Lee on different shipsand he always had a great smole and a good friendand now he will be sailing on calm waters beyond the sunset.smooth sailing Lee. To the Fralic family: So very sorry to read of Lee’s passing. He always was smiling and I know he loved each and every one of you very much. Our thoughts and prayers are with you all. Judy &Carmen, Sorry to hear your Dad has passed away. My condolences to both of you and your families. To the Fralic family,When I think of Lee,I think of the good times he had playing cards at the Seniors Club.May he rest in peace and God bless his family in their time of sorrow. TO all the Fralic family sorry to hear of Lee`s passing. Thinking of all of you in our prayers and thoughts. judy…….sorry to hear of your dad’s passing. Thinking of you and your family at this time. To all the Fralic family – so very sorry to hear of Lee’s passing – our paths crossed a few times since we moved to Eagle Head and we remember his great smile. My thoughts and prayers are with you at this time. I am sure you have many good memories of your Dad and keeping them to the forefront will ease some of the pain. If there is anything I can do, I am only a phone call away. God bless you all. So sorry to hear about your Dad! Take care. Very sorry to hear of your Dad’s passing, sending our sincere condolences to you and the family. Carmie,so sorry to hear of your Dad’s passing. Also to my Daddy(Cecil) hugs and kisses to you in your time of sorrow. I’m so sad that this has happened to you but know that he is playing cards up there with Fred White a long time friend having a laugh. My sincere condolences to the family at this sad time. My thoughts & prayers are with you all @ this very difficult time. Take good care! We were very saddened to hear about Uncle Lee’s passing. We are very sorry for your loss, our thoughts are with you. I was speaking with June and Terry, Ingles and Seldon and they also pass on their deepest sympathies to the family. Dear Carmie, Judy, Sheila, Denise and all of your families as well as other relatives of Lee ~ extending heartfelt sympathy during your loss at this time. I was proud to have had Lee as a father in law and as a friend for so many years. No doubt he was one of a kind and loved and liked by so very many people. Lee will be missed that is for sure but he left a legacy behind in all of you so for now cherish all of your memories of Lee and know that so many people share in your sorrow at this time. Ann and I will miss the visits we had with Lee and will cherish the ones we did have. Take care for now, know we are thinking of you all at this time of sorrow, and by the way I believe that the next night you look up at the stars in the sky you will surely see a brand new shiny star twinkling down at you as if to say take care my children ~ relatives ~ & friends, it’s all good up here and I will be watching over you all from above. My thoughts are with you all,me and lee spent a lot of time together over the years he was with Blanche and we always enjoyed that time. I will miss him. Will miss you lots and lots Grampy Lee!! My thoughts and prayers are with you Mom (Denise), Judy, Sheila & Carmie. My Deepest sympathy on the passing of your Dad. He was a fun guy and will be missed by all those who knew him .Our thoughts and prayers are with you at this sad time. Your last visit to the old house was a memorial one for us.. Hope you found the old car you wanted to restore.. You will be looking out over the Queens County now forever more. I am sure your a welcome sight in the heavens above. We will miss you forever. Judy – our deepest condolences in the loss of your father. Judy, just found out yesterday about your Dad and was shocked!! Wish I could have been there for you. As I was reading the many many condolences I realized how much he was a well loved, liked and respected man. He was an awesome man, always ready for a hug and a laugh, I loved his smile like everyone else it seems! You have been fortunate to have such a great father, he shines through you! I love your smile too!! I too will miss seeing him forever! Deepest sympathy on the passing of your Dad. Your father always had a nice smile and that Positive Attitude with everything he done. He will be deeply Missed and impossible to replace, as he was the link that made others Happy. Donald Mac Kay In Duncan B.C. Sorry to hear about your Dad. Our prayers are with you. Uncle Lee whose good nature and fun loving spirit will be missed forever. It was always a joy seeing you when I came for visits. You will be greatly missed and forever held close in my heart. Sorry to hear of the passing of your Dad. I remember him well and have many fond memories of all of you.